Black, black with cross (a distinctive color marking running from the mane over the spine intersected by another line crossing the withers), brown (light, medium and dark), gray-dun, red (includes sorrel, russet, red roan, "pink"), spotted (or "pinto" with a base color) and white. The word “donkey” in the United States often refers to the domesticated animal, and the term “burro” refers to the wild, untamed version. Donkeys and burros are two names for the exact same animal. However in the western United States, a small donkey is sometimes referred to as a burro. The term burro is simply the Spanish name for a donkey. The small gray donkey of Northern Africa was the progenitor of the Spanish burro, which came with the conquistadors to Mexico and South America. These animals later played a key role in the settlement of our American West. 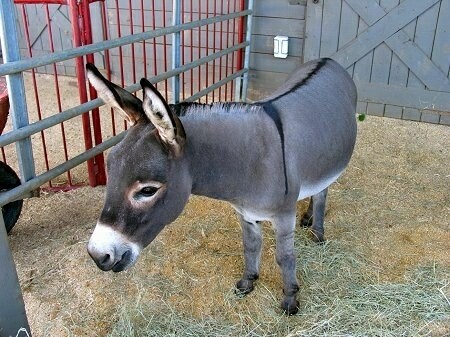 The English word "burro" comes from the Spanish word "borrico," meaning donkey. Regardless of whether a donkey is for breeding, show or work purposes, donkeys should have proper proportions and conformation. Donkeys were, and still are, work animals in many parts of the world. The conformation of donkeys therefore must be that of working animals. The head should be short rather than too long, but in proportion with the rest of the animal. Straight or slightly dished profile. Eyes large, of mild expression, set low, wide apart and clear. Nostrils well shaped and open. Teeth in good condition with no undershot or overshot jaws. Jaws generous, round and open. Head deep through the jaws, tapering to a small muzzle. Ears long, clean cut, set upright, carried firmly and alertly pointed. An appearance of strength and masculinity in jacks and femininity in jennys. The neck should be well proportioned to the rest of the animal, joined to head and shoulder correctly and smoothly. The crest of the neck should be fairly straight, not ewe-necked, nor fallen to the side or excessively fat. Neck firm, well fleshed and strong. Mane usually short and upright, but may fall to the side as with the horse mane. The donkey’s withers should be practically nonexistent, but if noticeable so much the better. Shoulder slightly sloping, although more upright than the horse. The ribs should be well sprung with a deep girth. Chest relatively wide, not narrow. Back short and level, or slightly dipped in the case of older animals or in foal jennys. A long, out of proportion back is undesirable. The loin should be strong, broad and firmly coupled. Quarters long, wide, and as flat as possible. Should be well fleshed with plenty of length between point of hip and point of buttock. When viewed from the rear the thicker all parts of the quarters and thighs are the better. Top of croup rounded, not extremely sloping. Tail well set, not low, covered with short hair and completed by a tuft of long hair. Hooves should be even, of good shape and well-trimmed. They should be hard, clean, smooth, elastic and tough. The size must be adequate to the donkey, but true to the typical donkey hoof which is narrow. No tendency to low heels. Front foot oval, hind foot more elongated and frog small but well developed. Their movement is to be level and true, willing and active. Contrary to popular belief donkeys are NOT stubborn-headed animals. They are actually quite intelligent and cautious. They are cautious of new experiences and environments and will stop to take in all that is around them before proceeding. They are careful to observe around them (i.e., other livestock, pets, land) before carrying out a task. This may be where the misconception of stubbornness arises. Donkeys need companionship, and left alone, they are prone to depression. If you are considering a donkey, you might want to think about getting two. Other animals, such as sheep, goats, or horses, suffice, but donkeys are happiest accompanied by other burros. Keep in mind that some burros/donkeys are used as guard animals. This means that they are protecting the barnyard flocks from predators, i.e. dogs, coyotes, etc. Keep this in mind, since donkeys/burros are not good companions for dogs. Though some will be quite happy with a canine companion if they are raised together from a young age, and can actually become quite close to one another. Donkeys / burros / mules are rather hearty and can handle most moderate living conditions. Caring for your donkey should include a lean-to or shelter to keep them out of severe weather. They prefer to have their own area in a dark barn to get out of the summer heat and away from flies. Summer flies are extremely aggravating to donkeys, especially when pastured with cows. You may use fly sprays made for horses to keep the flies off of them. In the winter this shelter helps to keep your donkey dry. A wet coat is most undesirable to your donkey / burro / mule and can cause your pet to get sick. Providing access to a shelter will help to keep your pet in optimal health. Your donkey / burro / mule will need a fenced in area with a minimum of three acres of pasture. For each additional donkey count on an additional acre. Keep in mind the condition of the land. If your pasture is of poor foraging conditions you will need to supplement your pet’s diet as discussed above. About every two days, you might need to muck (clean) your burro's stall or lean-to. Overfeeding, and its side effects, is a burro’s number one health problem. Burros originated in the North African deserts and flourished in our Southwestern deserts. Because burros are accustomed to a desert environment, they cannot tolerate nutrient rich food. Overfeeding a burro results in obesity, founder, colic, and/or severe skin rashes sometimes referred to as "protein poisoning." Consult a veterinarian in any of these cases as they can be deadly. Regular hoof care is extremely important for your burro. Without proper foot care your pet could become lame and suffer needlessly. Wild burros kept their hooves in good condition by foraging for over 20 miles or so a day on dry desert lands. 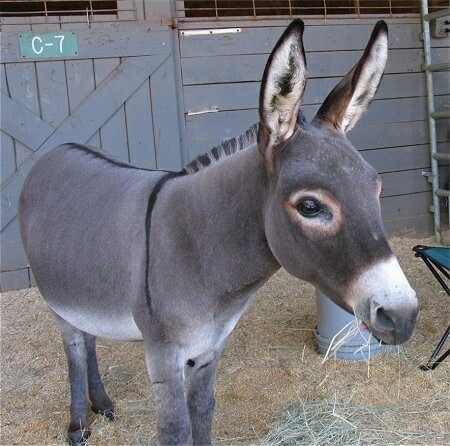 A "pet" burro cannot maintain good hoof condition by wandering around your pasture or corral. You must care for his hooves by having them trimmed every 6 to 8 weeks by a reputable ferrier. Burros tend to stand on their toes more than horses. When trimming your burro’s hooves, they should be trimmed to what is natural for a burro (hoof angles average 60-65 degrees). Also, be sure your burro has a dry place to stand since his feet are prone to abscesses and white line disease that occurs in moist areas. If you notice your donkey / burro has food stuck in its teeth or trouble chewing you should consider having them looked at. Your burro / donkey’s teeth will need adequate care. Your animal's teeth should be checked on a yearly basis. Their teeth grow continuously throughout their life and are continually worn down by eating. If they wear unevenly, sharp edges or points develop that cause him pain and prevent him from adequately chewing his food. Your veterinarian can file off these uneven spots as necessary by a procedure called floating. Vaccinate your burro / donkey annually as you would a horse since your burro can be susceptible to the same diseases. Consult your veterinarian on recommended immunizations and time frames. De-worming is also essential for burro care. Consult your veterinarian on a recommended de-worming schedule. Some vets recommend de-worming every 3 months. The same kinds of de-wormers used for horses can be used for burros; bear in mind that burros may weigh significantly less so dosage should be modified accordingly. Fungus, lice and parasites may infest your donkey’s coat if it is not cared for carefully, so be aware of these potential problems and treat them accordingly. Brushing is preferred over bathing since burros / donkeys prefer not to be wet. To help your burro get through the winter comfortably, provide him with plenty of unfrozen water, good hay, shelter and a dry place to lie down. Some recommend brushing the coat to fluff it up, as fluffed hair traps air to act as an insulation layer and keep him warm. Others say this is bad practice and may remove the insulating layer. Donkeys will forage through their pasture looking for grasses and plants to eat. A donkey that is put into a grass pasture will need very little, if any supplemental hay, so long as the grass and other plant life is plentiful. Be sure to monitor their weight to make sure they are not getting too fat. You may have to limit their grassing time. General information about feeding your pet: All equines are sensitive to toxins that can be found in spoiled feeds, so all feed should be free from mold. All changes to diet should be made gradually to avoid colic and digestion disturbances. Donkeys prefer to browse for their bulk and fiber throughout the day and prefer to eat little and often. Although you may love your donkey, don't love him (feed him) to death! Do not overfeed your donkey—check the body condition of your donkey regularly as overeating is detrimental to your donkey’s health. Donkeys do not need high levels of sugar in their diets. Always provide a mineral lick and permanent access to a clean (and unfrozen) water supply. Hay: If you anticipate feeding hay to your donkey / burro during the winter you need to take into account the type of hay you are buying and the time of year that it was cut. The quality of your hay will make a notable difference in your pet’s diet requirements/supplements. Meadow hay is a mix of grasses grown on old pasture and is good for feeding to donkeys. Remember that late cut hay will have lower energy values. If you are purchasing hay from a local farmer keep in mind your local weather conditions (rainy wet weather, drought) control the cutting season (late May to mid-June). Buying local hay gives you an advantage in knowing the value of your purchase. If the cut is later in the year a lot of the nutrient value will have gone out of the grass and some of the grass will have gone to seed. This type of hay is much lower in energy value than early cut hay and for that reason it is fine for feeding to donkeys. This 'second cut' hay is usually lower in energy value and again is fine for donkeys. To reduce the risk of colic and laminitis mix the new hay with the previous year's hay or with straw for a few days. Make a gradual change over in the feedings. All fresh cut hay should be stored in a dry barn for approximately two months before feeding it to your pet. Minerals and Vitamins: It is recommended that your donkey / burro have free access to an equine mineralized block, which contains various minerals including salt, to supplement their diet. Donkeys obtain many vitamins and minerals from the straw, grass and hay in their diets. Blocks designed for other livestock may be dangerous for donkeys as some contain inappropriate mineral levels. Please check labels before purchasing and feeding. Straw: Poor quality meadow hay is comparable in feed values as a good quality barley straw would be. Alternatively, oat straw can be fed; this usually has a slightly higher nutritional value than barley straw. Wheat straw is very fibrous but has lower feed values. Linseed straw is poisonous and should be avoided. Chaff and Freeze Dried Grass: Chaff is a mixture of chopped up hay and straw and there are many types of chaff on the market. Consult your local feed/grain store for proper diet ingredients. Dried Sugar Beet Pulp:Sugar beet cannot replace hay or one of its alternatives, but it is a useful source of succulent and nutritious fiber when added to the feed. If your pet donkey is sick it is also a good trick to keep in mind for getting him to eat. Haylage: Haylage is semi-wilted grass that has been allowed to dry to only 55-65% (as compared to 85% in hay). Haylage is baled, compressed and vacuum sealed into heavy plastic bags and is highly palatable and nutritious. Succulents: Turnips and carrots encourage appetite and are a worthy addition to the regular diet in winter and early spring when fresh grass is not available. Do not feed root crops that have been subjected to frost, or green potatoes as these may contain molds and toxins which are toxic to your burro / donkey. Water: Clean, fresh water should be freely available at all times. Remember to check water supplies in cold weather to ensure they have not frozen. Require daily exercise. They need to have enough land to exercise themselves. Donkeys and burros have a lifespan of 30 to 50 years, which is greater than that of the horse. Be a responsible pet owner. When contemplating purchasing any please consider its lifespan before purchase. Jennet/jenny will carry a foal an average of 12 months before giving birth, however, the length of gestation ranges from 11 to almost 14 months. Since the length of gestation is so long, it is wise to consider the time of year that your jenny will foal, and confine the breeding season to a timeframe of May to August. Either side of these dates will require a suitable barn in colder climates to ensure the survival of the foal and health of your jenny. Jennets/jennys should be given a quiet life during pregnancy with regular exercise either at liberty. Light riding and driving may be done if they are accustomed to such work. Fast paced and difficult labor should be avoided until after your jenny has delivered. Unless your jenny is thin, the feed regimen can remain unchanged until about the last 3 months of gestation. This is when the fetus is growing the most rapidly. Excessive feeding early on in pregnancy will create obesity which could result in potential problems during delivery. Increased feed amounts should be maintained from the final quarter of pregnancy until the end of the first three months after birth because maximum milk production and demand occurs during this time. When mated to a horse, roughly one in a million mollies have been known to be fertile. A mule crossed with another mule is never fertile.